Win in Las Vegas every day without Gambling! It's the newest and best way to be a real Las Vegas VIP! More than 43,000 People Obtained our Las Vegas Discounts in the first 12 months! You can get. . .
2 for 1 Prime Rib Dinners and More! The Secret to saving money and be treated like a real VIP is now available to the public. Save money daily at hundreds of Las Vegas business on services and everyday items. There are no coupons to carry, no limits on how many times you can use the discounts! Become a member today and choose (2) Two FREE tickets from either Show! The Las Vegas Membership Discount Card is the Undisputed King of Las Vegas Discounts! Get Daily Discounts on. . .
* Plus 100's more Discounts! Order One Year of Discounts Today! 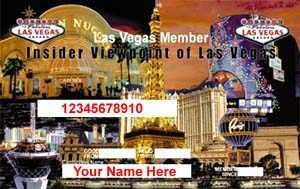 The Insider Viewpoint of Las Vegas Membership Discount Program was established in 2001 after Richard Reed, owner of Insider Viewpoint of Las Vegas, completed a search for a better Membership Discount Program. Mr. Reed realized that everyone enjoys great deals and discounts so after three years, numerous research studies, opinion polls and surveys his program became a reality for thousands. Mr. Reed knew coupons contained several drawbacks; ink rubbing off, expiration dates and for many people, Mr. Reed concluded, using coupons was embarrassing. So, to deliver thousands of discounts that members could use locally he believed that printed distribution was impractical and too costly. Therefore, the creation of a plastic credit card was decided as the most effective tool to deliver discounts to members. Now, members carry a plastic credit card valid at participating businesses to receive thousands of Las Vegas discounts. The key to the IVLV Membership Discount Program�s success was to deliver the best discounts and each one must be reusable day after day! Daily reusable coupons had never been tried in Las Vegas before! Yes, every discount within the program can be reused each and every day for one full year. Membership in the IVLV Membership Discount Program is for one full year from the day you buy your membership, not a calendar year. Las Vegas Discount Card pays for itself the First Time you use it! Our easy to use Membership Discount Card allows you 100's of daily discounts without the hassle of coupons. There is no obligation to gamble or stay in a particular hotel or casino to enjoy your discounts. Las Vegas Discounts you can use every day of the year! We have hundreds of Testimonials. See what others say about our Las Vegas Discount Card. NO other discount coupon program, coupon books, fun books, or discount packages compares to the fantastic quality / quantity of savings we offer. SAVE $1000's with the Insider Viewpoint of Las Vegas Membership Discount Card. Order Today! Forget coupon books, the hassle of remembering to bring the coupons, expiration dates and the burden of carrying several pieces of paper around with you. Your Membership Card entitles you to discounts from hundreds of businesses for one full year with savings of more than $100,000.00. We "DO NOT" sell, rent or share your name, email address, or any personal information to anyone!